The Earthquake Forecasting and Predictability (EFP) focus group coordinates five broad types of research projects: (1) the development of earthquake forecast methods, (2) the development of testing methodologies for evaluating the performance of earthquake forecasts, (3) expanding fundamental physical or statistical knowledge of earthquake behavior that may be relevant for forecasting earthquakes, (4) the development and use of earthquake simulators to understand predictability in complex fault networks, and (5) fundamental understanding of the limits of earthquake predictability. We seek proposals that will increase our understanding of how earthquakes might be forecast, to what extent and precision earthquakes are predictable, and what is a physical basis for earthquake predictability. Proposals of any type that can assist in this goal will be considered. In order to increase the amount of analyzed data, and so decrease the time required to learn about predictability, proposals are welcome that deal with global data sets and/or include international collaborations. For research strategies that plan to utilize the Collaboratory for the Study of Earthquake Predictability (CSEP), see Section 11 to learn of its capabilities. Successful investigators proposing to utilize CSEP would be funded via core SCEC funds to adapt their prediction methodologies to the CSEP framework, to transfer codes to the externally accessible CSEP computers, and to be sure they function there as intended. Subsequently, the codes would be moved to the identical externally inaccessible CSEP computers by CSEP staff who will conduct tests against a variety of data as outlined in the CSEP description. Support the development of statistical or physics-based real-time earthquake forecasts. Utilize and/or evaluate the significance of earthquake-cycle simulator results. See sections on WGCEP and CSEP for more details. Study how to properly characterize and estimate various earthquake-related statistical relationships (including the magnitude distribution, Omori law, aftershock productivity, etc.). Focus on understanding patterns of seismicity in time and space, as long as they are aimed toward understanding the physical basis of earthquake predictability. Develop useful measurement/testing methodology that could be incorporated in the CSEP evaluations, including those that address how to deal with observational errors in data sets. Develop approaches to test the validity of the characteristic earthquake vs. Gutenberg-Richter earthquake models as they are used in seismic hazard analysis. The Earthquake Forecasting and Predictability (EFP) group facilitates a range of studies aimed at improved data and methods for developing earthquake forecasting techniques and assessing earthquake predictability. Figure 1. Map of major structural elements of the plate boundary fault system in and around the US/Mexico border region. Traditionally, this is the principal activity of the SCEC EFP community. This year, Jackson and Strader explored prospective earthquake forecasts based on Coulomb stress changes. It has been shown that instantaneous Coulomb stress or shear stress changes apparently influence the locations (but not the magnitudes) of future earthquakes. 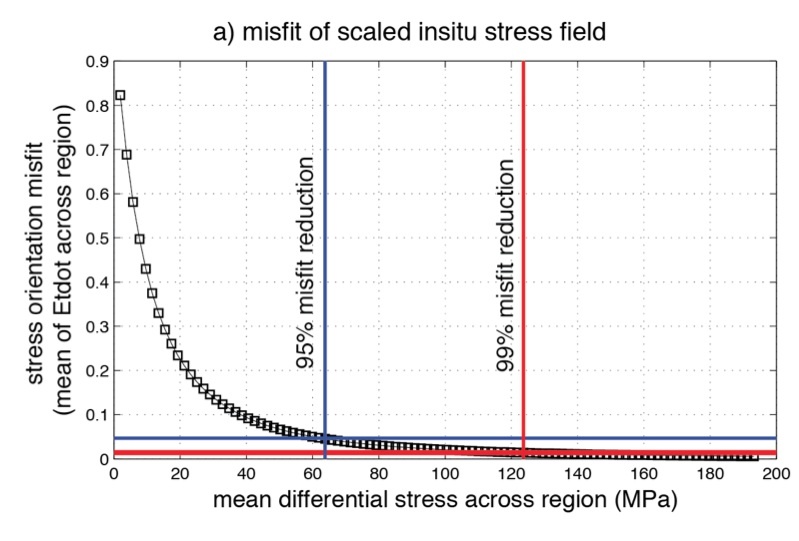 In particular, it has been shown that with 95% confidence, M ≥ 2.8 earthquakes preferentially nucleate where shear or Coulomb stress increased; and on average, 59% of earthquakes occurred within stress-enhanced zones, regardless of the choice of rupture plane or type of stress change (Strader and Jackson, 2014, 2015). These conclusions are corroborated by the studies of Werner, Marzocchi, Gerstenberger, and Liukis. The team conducted a retrospective evaluation of short-term forecasting models for the Darfield M7.1 sequence. It has been reported that Coulomb/rate-state models and hybrid Coulomb/statistical models provided more informative forecasts during the sequence than statistical models over all tested forecast horizons (1-year, 1-month and 1-day). The team also tested how well the information gains of medium-term forecasting models can be explained by short term earthquake clustering conforming to the Omori-Utsu law, and the optimization and testing hybrid models and exploration of their potential as a powerful testing tool within CSEP for the future (Gerstenberger et al., 2014, Helmstetter and Werner, 2014, and Steacy et al., 2014). Based on the above results, it has been concluded that an optimized combination of smoothed seismicity and Coulomb stress may show improved success in prospective forecasts experiments. The results provide support for the Coulomb/rate-state earthquake triggering hypothesis and may eventually guide the model development for Operational Earthquake Forecasting (OEF) systems. Forecasts of the focal mechanisms of future earthquakes are important for seismic hazard estimates and other models of earthquake occurrence. Kagan and Jackson (2014, 2015) approached this problem by performing a high-resolution global forecast of earthquake rate density as a function of location, magnitude, and focal mechanism. In these forecasts they have improved the spatial resolution to 0.1 degrees and the latitude range from pole to pole. The focal mechanism estimates require distance-weighted combinations of observed focal mechanisms within 1000 km of each grid point. Simultaneously they calculated an average rotation angle between the forecast mechanism and all the surrounding mechanisms. A topic of continuing interest in EFP is testing recurrence models for plate boundary faults. 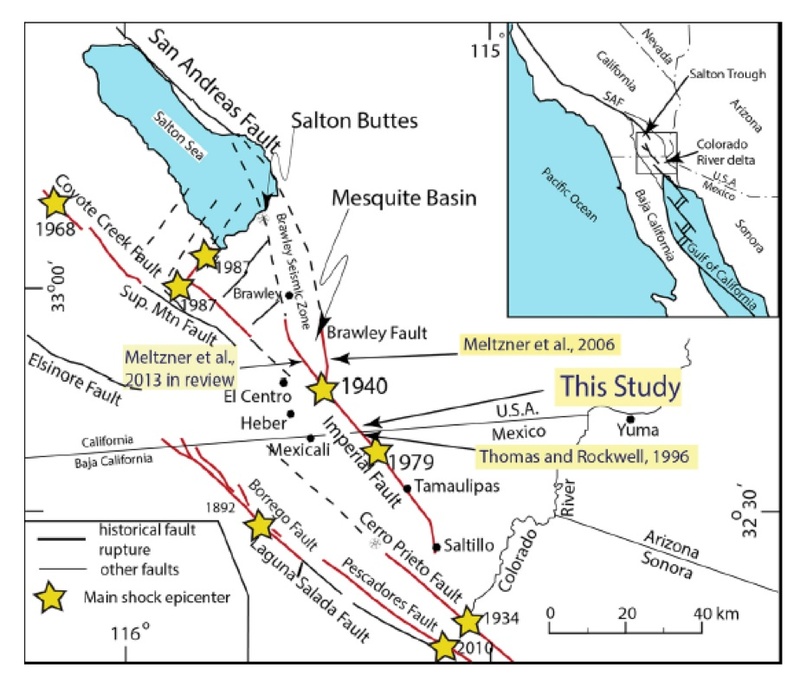 The project by Rockwell, Jerrett, Wessel, and Klinger addressed this problem at the Imperial fault in the Salton Trough. It is the main plate boundary fault that transfers most of the displacement across the international border. It also has the distinction of being the only fault in southern California that has sustained two well-documented surface ruptures in the historical period (1940 and 1979). The project tested basic recurrence models for the Imperial fault. In particular, it suggests that the region of large 1940 displacement in the border area is a resilient asperity (Meltzner et al., 2014; Rockwell and Klinger, 2013). Another aspect of forecast development is to search for earthquake precursors. It has been hypothesized that earthquakes may be preceded by aseismic slip transients, which may exhibit tremor-like signals. The presence or lack of emergent seismic signals is therefore of interest because they could provide information about any aseismic slip leading up to earthquakes. Hawthorne and Ampuero (2014) conducted a systematic search for tremor-like signals prior to 10,000 M 2.5-6 earthquakes in southern California. They found no evidence for emergent seismic signals, suggesting that emergent precursors are rare or small. Figure 2. Postcard for final UCERF3 Long Term Time Dependent model showing M>=6.7 participation probabilities throughout California. Figure 3. Event locations from the HYS catalog (1981 – 2014). Similar event clusters that have been relocated by using waveform cross-correlation are shown in black. Events in the SCSN catalog (and uncorrelated events in the other catalogs) are shown in brown. Events with M ≥ 5.5 are shown as stars. Faults are from Jennings (2010) with late Quaternary faults in shades of red. The SCEC community continued the Development of OpenSHA in Support of Operational Earthquake Forecasting, Hazard Assessment, and Loss Modeling [Field et al, 2015]. Major developments were made in support of UCERF3. This includes implementation of the long-term time dependent component of the UCERF3 model (UCERF3­TD). A preliminary short term operational UCERF3­ based forecast was also implemented and has gone through initial testing (UCERF3­ETAS). CyberShake collaboration has also been strong in this report period, including addition of Maximum Considered Earthquake Response (MCER) calculations for the Utilization of Ground Motion Simulations committee. The final UCERF3 time dependent model was released on March 10, 2015 and received broad media attention. There are many groups in many different disciplines currently taking steps to adopt it. The CyberShake MCER work will hopefully soon lead to inclusion of CyberShake results in the building code for the Los Angeles region. 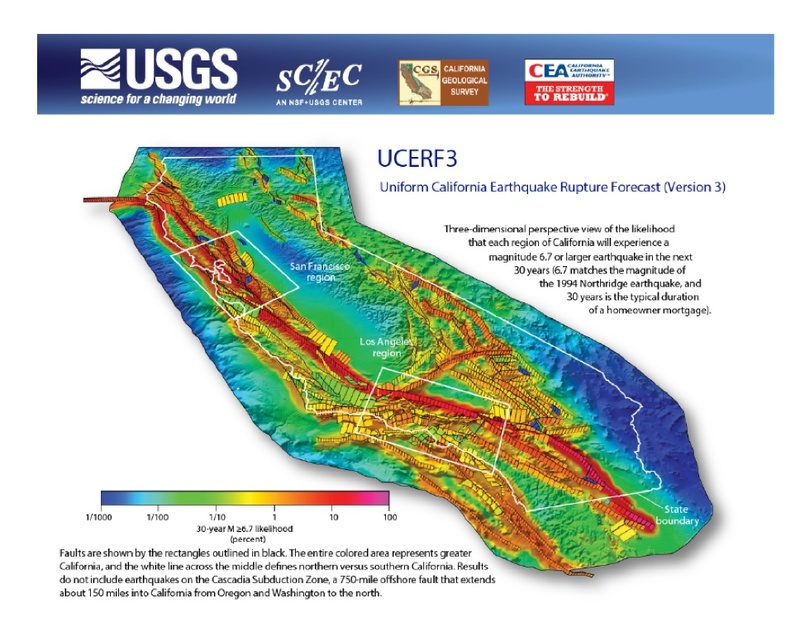 In addition, Ward performed a study to step up from the existing ALLCAL2 fault system to one that represents the UCERF3 fault system as closely as possible and to compare earthquake simulator output with UCERF3 forecasts. The current UCERF3-ES (the name of the product) for California includes 25,586 elements. The study resulted in the first statewide rupture forecast and seismic hazard calculation based on earthquake simulation. Also, see a YouTube movie. SCEC EFP community continued studies of earthquake clustering. Shearer had focused on studying earthquake triggering models and their relationship to swarms and foreshock sequences. The project identified several aspects of the space/time clustering of seismicity that cannot be explained with standard (i.e., ETAS) triggering models, including details of the foreshock and aftershock behavior for small earthquakes. In particular, it was found that a significant fraction of small earthquake clustering is swarm-like and probably caused by underlying physical drivers, such as fluid flow or slow slip. A search begun for correlations of seismicity with aseismic transients observed in geodetic data, in particular near the laser strainmeters at Piñon Flat Observatory (PFO) and surrounding borehole strainmeters from the Plate Boundary Observatory (PBO). At least ten examples have been identified where strain anomalies are associated with peaks in the local seismicity rate. Zaliapin and Ben-Zion investigated seismic cluster anomalies in relation to different loadings and large earthquakes. 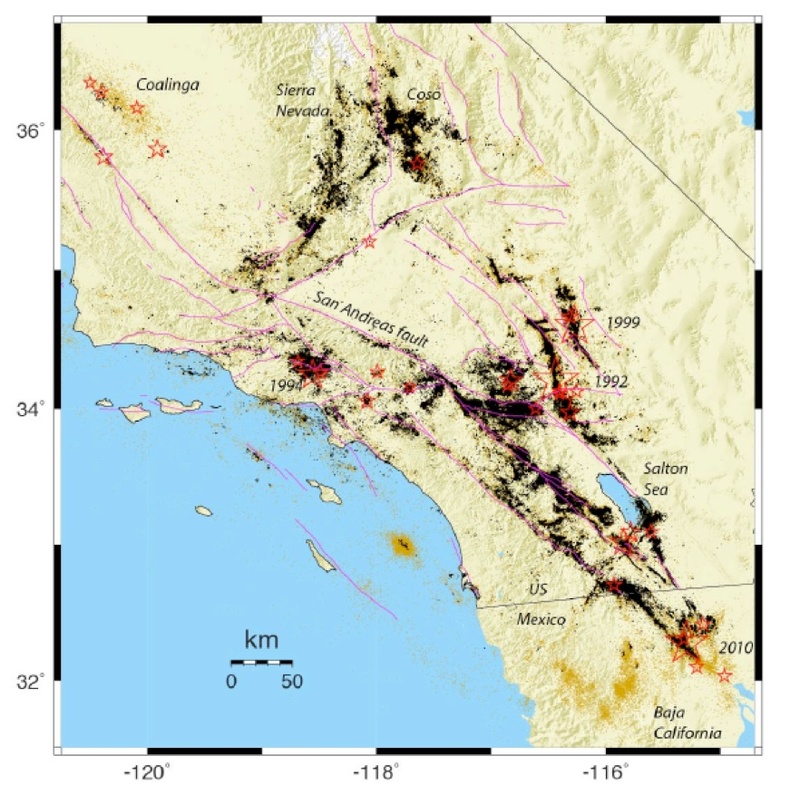 The results of this project suggest that (i) the cluster properties systematically evolve in time, according to several robust cluster measures, in the spatio-temporal vicinity of the largest earthquakes in southern California, and (ii) seismic clustering differs, and probably can be used to discriminate between the regions dominated by tectonic vs. human-induced seismicity. Overall, the cluster studies combined novel approaches to earthquake cluster identification/classification and high quality earthquake catalogs from different environments toward improved understanding of seismicity in relation to large events, human-induced earthquakes, and aseismic transients. Ability to track the evolving response of the crust to different loadings may be used to monitor the build up of stress in a region. This knowledge contributes to quantitative assessments of earthquake potential and seismic hazard in southern California. A project by Shearer and Hauksson focused on automatic processing of the SCSN waveform archive. This continued work has resulted in improving earthquake locations and focal mechanisms using waveform cross-correlation and S/P amplitude ratios, and on computing spectra for use in studies of earthquake source properties and attenuation. The latest version of the relocated catalog (so-called HYS catalog) contains high-precision locations of over 560,000 events from 1981 through 2014. The project also resulted in a newly created stress drop catalog for earthquakes between M1 and ~M3.5 with occasional events up to M5. The new catalog includes stress drops for more than 24,000 earthquakes between 2000 and 2014. Sammis and Sumy analyzed data from a dense, near-fault temporary borehole array deployed within the San Andreas Fault Observatory at Depth (SAFOD) main borehole by Paulsson Geophysical Services (PGS) between late April to early May 2005. The project objective is to illuminate fine-scale fault structures in unprecedented detail, and to look for evidence of interaction between the individual events. Preliminary analysis by PGS has located approximately 100 small magnitude earthquakes that appear to delineate three separate fault strands of the SAF. Geothermal power generation commonly induces seismicity. Brodsky has shown that the earthquakes in the Salton Sea region are directly related to the net extraction of fluid in the field. The study used an ETAS model to decluster the catalog and then related the background rate to publically available monthly injection and production data. The success of this project also shows that the induced earthquakes have aftershocks, which can potentially occur on other faults in the region. A work is now performed with CSEP to implement the Salton Sea algorithm in predictive mode. Chen et al (2011) studied stress drops in the Salton Sea geothermal region, and found that stress drop increases from 1.5 MPa closest to injection wells to 5 MPa at 300 m from injection wells, demonstrating the impact of the geothermal activity on the strength of the surrounding crust. Earthquake relocations show depth separation between shallow larger (M≥2.5) and deeper smaller (M<2.5) events. One path to studying the predictability of earthquakes is to better understand the relationship between earthquake occurrence and stress, including the background stress and static and dynamic stress changes from natural and human-made sources. The level of background stress is a first-order unsolved problem, with implications for a wide variety of earthquake physics problems including stress triggering. Luttrell et al. (2015) made significant progress on this problem, using models compiled by the SCEC Community Stress Model project. They integrated three stress models, each estimating a different component of stress due to a different set of physical processes (plate driving, fault loading, topography) with stress orientation observations from focal mechanisms, to determine a minimum estimate of the 3D stress tensor across southern California at seismogenic depth. 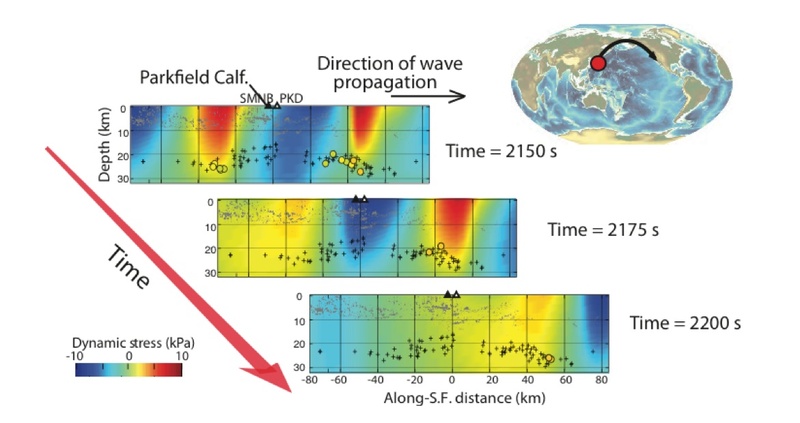 They found that the stress field must have a differential stress magnitude of at least 60 MPa at seismogentic depth in order to maintain the stress orientation inferred from focal mechanism observations in the presence of the observed rugged topography. The amplitude and length-scale of heterogeneity of the background stress field at seismogenic depths is also poorly understood. A better documentation of stress heterogeneity in southern California is essential to constrain rupture propagation of major earthquakes and associated regional seismic hazards. Goebel et al. (2015) investigated stress orientations in the SCEC Special Fault Study Areas in San Gorgonio Pass and Ventura Basin. They found that principle stress orientations are substantially more heterogeneous within the San Gorgonio area indicating a general heterogeneity of stress accumulation and release within the area. Persaud et al. (2015) used well logs from drill holes in the Los Angeles basin to interpret principal horizontal stress directions from borehole breakouts. High-density observations in one oil field indicate variation of the direction of the stress axis orientations over horizontal distances less than 1 km at depths from 2-3 km. This variation is over a smaller scale than what is envisioned for the current community stress field models, and agrees with some theoretical models. Earthquake stress drops may also provide information about the stress field. Goebel et al (2015) found that stress drop are approximately inversely correlated with fault slip rate along the profile of the San Andreas fault zone, implying that slower-slipping sections reach higher stress levels because they have longer to heal and strengthen between earthquakes. In addition to static and dynamic stress changes, earthquakes may trigger other earthquakes due to viscoelastic stress relaxation. This time evolution of stress may play an important role in explaining delayed earthquake triggering. Meade et al. (2013) modeled these anelastic processes to study the basic behavior of long-term viscoelastic stress transfer using a novel fault system geometry, periodic and aperiodic earthquake sequences, and phenomenologically motivated polyviscous rheologies. Non-volcanic tremor appears to be more sensitive to dynamic stress triggering than tectonic earthquakes. Gonzalez-Huizar et al. (2015) detected new cases of dynamically triggered tremor at Parkfield. They model the local static stress, and the dynamic stresses caused by passing triggering seismic waves from remote earthquakes, and show that the triggered tremor are correlated with the largest dynamic stresses. Peng and Yang continued the effort of a systematic search of tremors in California. The lack of additional triggered tremor beneath the San Gabriel Mountain in southern California indicates that near-lithostatic fluid pressure is necessary but not sufficient for tremor to occur. In addition to earthquakes and tremor, fault creep is also affected by the local stress field. Lindsey et al. (2014) find that localized fault creep corresponds to transpressional areas of the southern San Andreas fault, while a 1–2 km wide zone of distributed yielding is most likely to occur along segments of the fault where the local stress state is transtensional. Using a two-dimensional boundary element model, they show that stresses resulting from slip on a curved fault can promote or inhibit inelastic failure within the fault zone in a pattern matching the observations. Critical to making progress in understanding the stress field and its impact on earthquake occurrence is supporting collection and analysis of geodetic data. To this end, SCEC supported a workshop of the Community Geodetic Model. The goal of this project is to produce a comprehensive geodetic time series data product that leverages the complementary spatial and temporal features of Global Positioning System (GPS) and Interferometric Synthetic Aperture Radar (InSAR) data. SCEC also continues to support the Piñon Flat Observatory, which records high-quality continuous crustal deformation data in proximity to the San Andreas and San Jacinto faults. The long span of the PFO records provides a unique basis for identifying and evaluating new signals. Paleoseismic events are central to earthquake forecasting because of the short historic/instrumental record. Jackson et al. (2015) found that the paleoseismic events used in the UCERF3 hazard report occur at an average of more than 4 per century. However, none have occurred since 1910, about the dawn of the instrumental seismic era in California. The hiatus since 1910 is very unlikely (about 1 % probability) to occur at random given the previous rate, whether the recurrence of previous events is Poissonian or Quasi-periodic, or whether it is computed from physics-based simulators. The hiatus of the last century points to remarkable statewide clustering not previously recognized and not yet modeled, or to inconsistencies that could require corrections to UCERF3 earthquake rates. This work highlights the importance, for understanding earthquake predictability, of continuing work to increase the number of paleoseismic sites in California and to develop improved paleoseismic methods. Possible new paleoseismic sites were explored on both sides of a sag pond along the San Andreas fault near the southern boundary of the Carrizo National Monument (Akciz, 2015). They found that 3-8 earthquakes occurred in the last 2000 years, with abundant liquefaction evidence. However, due to limited, discontinuous sedimentation, high water table, and the narrow fault zone with few splays deforming the stratigraphic units that fill the sagpond, they concluded that it was not an ideal site for further investigation. Evans et al (2014) focused on fieldwork in the Mecca Hills, where they have examined the five largest faults east of the San Andreas fault, with 12 study sites where detailed fault-related data were collected. Rockwell et al. continued to improve the age control for Lake Cahuilla sediments to correlate individual lakes across the Salton Depression. The goal is to place the past 1500 years of earthquakes in the southern San Andreas fault system into a common chronology. From such a paleoseismic database, the relative timing and sequencing of large events among the different fault zones can be constructed. Berelson et al. (2015) investigated whether grey layers in the sediments in Santa Barbara Basin may represent tsunami or seismically triggered sedimentation. Seismic shaking and a resultant turbidity current or nephaloid layer deposit is their preferred interpretation for origin of grey layers. The Collaboratory for the Study of Earthquake Predictability (CSEP), operated by the Southern California Earthquake Center (SCEC), provides a research cyber-infrastructure for independent and prospective testing of earthquake forecasts. As such, CSEP is well situated to evaluate operational forecasting models of earthquake potential and ground motions by the USGS, GEM and other international governmental and non-governmental organizations. The ongoing development and implementation of operational models, however, entail new requirements for CSEP’s infrastructure, methods and experiment design. The purposes of this workshop were: (i) to assess the evolving needs of agencies for CSEP-based testing of OEF and seismic hazard models, (ii) to disseminate and review recent CSEP and GEM Testing & Evaluation (T&E) results, (iii) to assess the adequacy of CSEP’s current methods and infrastructure in light of evolving needs, and (iv) to gather community input on the next steps for testing OEF and seismic hazard models. The website can be found here. To foster the collaboration and to introduce early career scientists to methods being developed both at SCEC and at ERI and DPRI, the second Summer School on Earthquake Science was held September 28 – October 2, 2014 at the Embassy Suites Mandalay Bay, in Oxnard, California. The theme of the school was Wave and Rupture Propagation with Realistic Velocity Structures. The emphasis was hands-on experience with SCEC Community Velocity Model (CVM), Community Fault Model (CFM) and the SCEC Broadband Platform (BBP). As such the school included both lectures and exercises where participants would delve into complex velocity structure and create seismograms from kinematic representations of earthquakes as propagating ruptures. The goal of the UGMS committee, since its inception in the spring of 2013, has been to develop long-period response spectral acceleration maps for the Los Angeles region for inclusion in NEHRP and ASCE 7 Seismic Provisions and in Los Angeles City Building Code. The work of the UGMS committe is being coordinated with (1) the SCEC Ground Motion Simulation Validation Technical Activity Group (GMSV-TAG), (2) other SCEC projects, such as CyberShake and UCERF, and (3) the USGS national seismic hazard mapping project. Significant progress toward developing the maps was made in 2014, and this summary report highlights the accomplishments and future work. The results generated during 2014 are encouraging and indicate that the UGMS committee should continue its efforts toward generating long period ground motion maps for Southern California for possible inclusion in (1) the next edition of the Los Angeles City building code, which would be a variation to the ground motions for Southern California in the ASCE 7-16 standard, and (2) the 2020 NEHRP seismic provisions and the ASCE 7-22 standard. The code cycle for the latter has already begun. A., T. K. Rockwell, and R.
six events. Bulletin of the Seis.